Marcus Biel (@MarcusBiel) works as Director of Customer Experience for Red Hat. He is a well-known software craftsman, Java influencer and Clean Code Evangelist. He is also a regular speaker at Java conferences all over the world, such as JBCN Conf Barcelona, JPoint Moscow and JAX London. Besides this, he works as a technical reviewer for renowned Java books such as Effective Java, Core Java SE 9 for the Impatient or Java by Comparison. In 2015, Marcus started a Java blog and YouTube channel that makes Java accessible to passionate developers. There are many advanced tutorials that you can find online, but tutorials with a solid background like this one are rare. Marcus has become well-known in the Java community, with a total of 70 000 followers across various social media platforms. In 2017, the editorial team at jaxenter.com rated him #13 in their list of the world’s top Java influencers. For Marcus, programming is not just a job, but rather a meaningful, creative craft that he practices every day with joy and passion. Therefore he attaches great importance to the quality of his work. 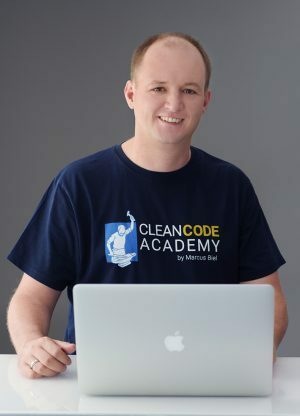 Marcus believes that while programmers can write ‘quick and dirty’ code, and deceive themselves that they are saving time and money, doing it properly is worth the initial time and effort. The code will then work reliably and consistently, require less maintenance, and prove to be more economical in the long run. When he takes a break from Java, Marcus likes hiking in the Alps as well as backpacking. He also likes dancing, a good beer or wine, and enjoying all that his hometown, Munich, has to offer. He lives with his wife and baby son, within walking distance of the Oktoberfest, and yes, he owns Lederhosen.